Visio Alternative - Desktop or Online? What to choose for Visio alternative, online or desktop? What are the pros and cons? This article will show you some differences between online software and desktop software from a user's point of view. Facing a vast of choices of Visio alternatives on the internet, it's really hard to tell which one is the best. Especially nowadays when coming the rise of online diagramming software, it's even harder to find the one which not just "looks good", but really works greatly. Which one do you prefer for Visio replacement, online or desktop program? Well, they can be both effective in creating flowcharts, org charts and other diagrams, but there are still many differences in terms of functionality and user experience. Desktop diagramming program has been a popular option for many years since Visio came out. Historically, desktop software has generally been more powerful, and you only need to pay once to own it. Since it doesn't need an internet connection to function, you can use it without worrying about connectivity issues. Once installed, you can use it at anytime, regardless of internet connection. All the symbols are already "in" the software, you don't have to wait for long time to load the symbols. Desktop programs work much faster and run smoothly all the time. Desktop software has more powerful features and with professional quality. No need to login your user name and password to get started each time. Through a one-time payment you can own it forever. Desktop programs are safer as they work behind the firewall. Desktop applications are limited by the hardware on which they are run. They need be installed on particular operating systems and under certain system requirements. Updates to the programs must be applied by the user to their installation. The desktop programs will occupy some space of your computer. For some people, one-time payment is not easy as the amount is big. Online diagram program is the web based software that you can access through any device when having internet connection. You don't have to download or install anything on your computer. You don't have to install or download any software or worry about upgrades. You can use it on any device with an internet connection. No need to take account of the operating systems. No matter what OS your computer is, Mac, Windows or Linux, you can use it. You can pay by month if you only need it temporarily. You cannot use online diagram software without internet connection. It relies significantly on Internet connectivity and speed. Therefore, it can be rather slow if your internet connection is poor. It takes time to load the symbols. When you move the objects on the canvas, it responds slowly. Paying monthly will cost you much more money if you use it a long term. As you can see, each type of Visio alternative has its own benefits and weaknesses and can be utilized best within its own niche. It's all up to your purposes when you decide what to use. Edraw is a solid Visio replacement desktop software coming with more than 200 drawing types. It's fully integrated into Microsoft Office, so you can add its drawings into Office documents. The software interface is very straightforward which will take you minimum time to learn. It includes a vast amount of examples and templates for beginners to start. Edraw Max is an ideal alternative to the Microsoft standard and much cheaper than Visio. 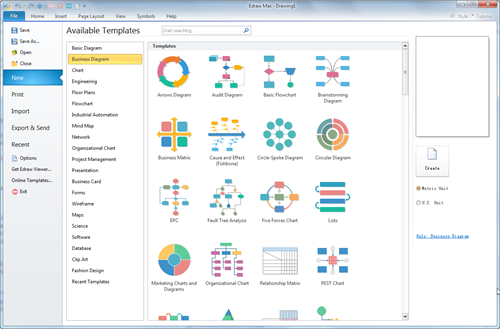 Download a free trial and discover endless abilities in diagramming.